Pirates. Thieves. Temptresses. The fallen classes of the Hyborian age live amongst the shadows, lurking and hiding in the dark recesses of every city. Civilised people often presume rules come from the gods or even from strange books wherein the "Truth" is written. Actions are either correct or incorrect and a culture of guilt arises from violating the tenets laid down by society. Societies who try to live by those rules breed shadows and these shadows are the fallen classes, by-products of all the impulses contrary to a given society's definitions of truth and order. Some consider the shadows evil, others see them as a necessity. Many long to give in to the shadows but pretend to condemn them. The fiercest—barbarians, nomads and borderers—are forces of nature impacting upon society. The finest—nobles, scholars and soldiers—are the creators and maintainers of society and 'law' itself. The fallen represent impulsive temptation—those who reject the 'Truth' insisted upon by the finest and challenged by the fiercest. To be one of the fallen is to be hunted by the so-called finest elements of society. To be one of the fallen is to have your deeds and beliefs treated as sinful, criminal or worse. The first section of this book reveals a shadow few want to discuss: the temptress. Although there are males who fit the role of tempter, the fears of Hyborian society usually revolve around the women who break society's rules, the women who stand up to men, the women who refuse to give in to the laws dictated to them by the men who dominate their environment. They angrily label these women as 'whores' but this is an inaccurate label borne of man's fears, an attempt to belittle those who have the strength to stand up to the establishment. The second section of this book discusses how the various cultures of Conan's age look at the pirate, thief and temptress classes. Advice is given on what skills and feats to emphasise for each culture's iconic brand of these three classes, as well as additional cultural information. In some cases, variant rules are offered to better portray these character classes in some cultures. The third section of this book reveals the secrets of the fallen classes. Information on ability score options, archetypal roles, new uses for old skills, information on crime families and thieves' guilds are presented. Also, new poisons and rules regarding shock and surprise are given. New combat manoeuvres also provide for varied combat and character concepts. The fourth section of this book shows how to mix and match the nine character classes to create new archetypes of the pirate, the thief and the temptress. Here you will find nymphs, vamps, sea captains, privateers, crime lords and many more. 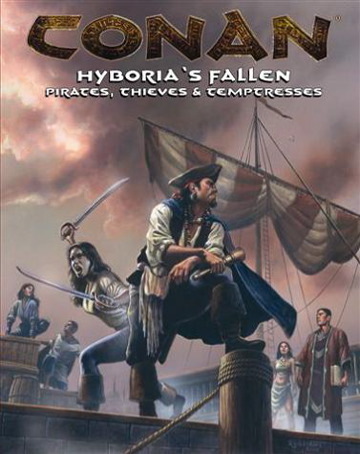 Sign in to start a discussion about Conan: Hyboria's Fallen—Pirates, Thieves & Temptresses (OGL)!